And the two icon elements in the inspector, I noticed the one not being used by default is commented out. As you can see, I'm able to manually toggle the complete state and the component changes in the React tool but the change is not rendered. I changed the default state to make sure both icons are loaded correctly and they are. I made a Codepen to try it in a different environment and this one works, but I am using the FA 4.7.0 CDN. 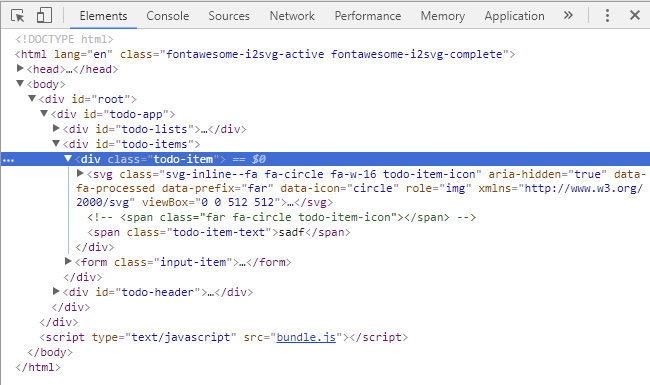 With the Codepen and FA 4.7.0, when I inspect the icon, it is just an HTML element not SVG. I'd like to get this component working with FA 5 so any help would be appreciated! Your code should work now. This answer is an edited version of my answer here: How can I get Font Awesome 5 to work with React?. See also https://stackoverflow.com/a/48552226/53790 and https://fontawesome.com/how-to-use/svg-with-js#auto-replace-svg-nest. I faced the same problem today with my ReactJS/Material-UI application. After much research I fixed the issue by using React's key property that forces an element to render when its associated state changes. Here I've used this.state.complete as unique value for the key but you could use anything you like so long as they are unique. Now, the span element is always removed on re-render and replaced by the other one. Hope this answer helps future seekers. How can I get Font Awesome 5 to work with React? Make Font Awesome icons in a circle? What do these three dots in React do? How get value datapicker in react toobox custom?